Parking for Mass: There is limited parking available behind Old St. Brigid's Church (near 1682 Broadway) in addition to street parking. Lunch: There are many restaurant venues in the downtown San Francisco area. 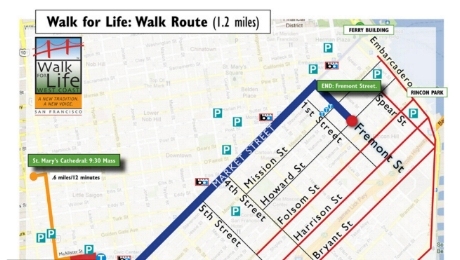 Getting to the Civic Center: The church is 1.3 miles from Civic Center Plaza where the Walk for Life begins. There is a bus line that stops in front of the church that can be taken for $2 directly to the San Francisco City Hall at the Civic Center Plaza. Another option for parking is to park near the Civic Center and take the bus back to the church on Van Ness Avenue. Walk for Life: Starts at the Civic Center of San Francisco. Rendezvous: the assembly location for the SSPX group at the Civic Center will be at the corner of Larkin and Grove (see the map). Special request: Attendees are asked to wear something yellow (e.g., a hat, scarf, shirt, jacket, etc.) to help identify our SSPX group. A limited supply of yellow scarfs will be available at the walk's start.